"Brightly shone the moon that night, though the frost was cruel"
There is something spiritual about being pregnant at Christmas (as I have been for the last two years). You cannot help but reflect inward and think of Mary and the precious babe she was carrying. I remember a warm peace coming over me last Christmas. Filled with worry through much of the pregnancy I was anxious to meet our blessing and be assured everything was okay. I remember sitting in the glow of our tree rubbing my ever expanding belly and finding comfort in that fear. This was not my first child. I was not an unwed young women. I was not riding a donkey into harsh frost of night. But because she suffered that pain and fear I am saved. Saved by her son. In our stories and paintings she is of course the imagine of grace. Always humble, always thankful. But she was human no? Susceptible to the same sinful ways and falls from grace as we are. She was just as likely to fall into the pit that hormones and tiredness ring your body through as I am, was. This year I am not pregnant. There is no bond to Mary, yet as I nurse a baby in my arms I still feel that pull. That pull to wonder, was she amazed and awed? Did she always look at him and think, he was a gift or did she go frustrated with his dirty clothes being left all over his room? I like to think that she was a mom just like the rest of us and there were good days and bad. The difference is grace. Not just to others, but grace to ourselves. to humble ourselves to the mistakes we make and know that tomorrow the sun will rise on that cruel frost and melt it away if only given the chance to shine out from behind the shadows. We're taking 5 minutes (or more) to reveal in the creativity and inspiration of the season, join us? 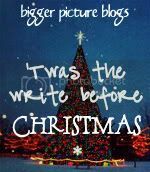 'Twas the Write Before Christmas (but it could also be the Photo, the Poem, The Recipe, the....) Who knows where the prompt will take you...this was not at all what I expected when I scheduled this prompt! So beautiful. What a great image of grace melting that cruel frost. The Christmas of my first pregnancy was spent on bed rest giving me much time to wonder and imagine. I too felt a real bond with Mary that year. My mother in law told me in a round about way that I was sinful in my consideration of Mary and her feelings. I was told that it wasn't "scriptural" to make of idol of her. Of course, I do not make Mary an idol (and you do not either) but it is so very important to have connection to the Mother of God, too. I appreciate that you DO connect with her. I understand that sentiment in a big way. It is funny how judgmental Christians are. Go ahead and celebrate Mary during this time, too. She did give so much for this world as well. "The difference is grace. Not just to others, but grace to ourselves." Oh yes! This is what I am learning this year - to give myself grace to forgive my mistakes and move on from them. And also? To not let my expectations of a "perfect" mom, wife, sister, friend to overshadow who He made me to be - to be free to be ME.